What Kind of Carpet do I use for High Traffic? Being a homeowner, it is exciting to think of renovations you’d like to do and envisioning them. While it is a fun thing to daydream about, you often only think of what color and what the décor looks like. When you are thinking of renovating there are many other things you should take into consideration, especially when you choose the flooring. Obviously, you want it to last for a long time, however, this can be an issue with family or pets. In other words, you will need flooring that can absorb wear and tear while standing the test of time. Guess what I have? ... The perfect flooring for you! If you haven’t heard of Innovia Xtreme Clean, I am glad to share my knowledge with you. Innovia Xtreme Clean™ carpet is crafted using cutting-edge Innotex™ - a natural-based fiber offering an incredibly plush feel and precision-engineered stain prevention technology that won’t ever wash off. Innovia Xtreme Clean™ is also environmentally friendly and there are many reasons why I would recommend this flooring. Can you say stain free?! The unique fiber makes this carpet permanently stain resistant, ensuring your carpets will always look good. It’s easy to clean! The carpet fibers have a protective shield that is flexible and durable. It repels spills and dirt, so it makes it a breeze cleaning up accidents and pet hair. It is pet-friendly!! Let’s face it, our four-legged friends are mess makers. This carpet has a shield that prevents your furry friend’s accidents and hair from absorbing into the fibers. Innovia Xtreme Clean™ is some tuff carpet worthy and there are many happy families all over the country that can attest to this. It stands up to stains, making cleaning a breeze! If you have a large family and are looking for flooring that can withstand the test of time, look no further. Thinking that this may not be in your budget? Think again, we are having specials for the rest of April and the month of May so make sure you head to our showroom and check out this amazing carpet! Stay tuned next month for our new blog post about flooring and décor! 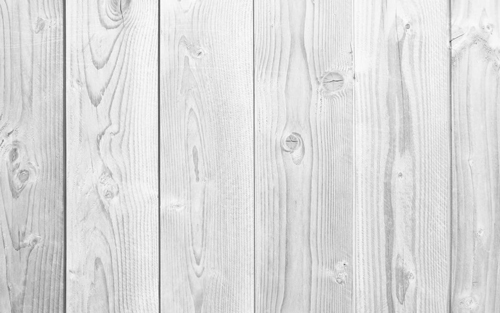 Where should you use Wood Planks? Hey, all you Pinterest fans! If you have a Pinterest, you have more than likely pinned a decorated room using wood planks. To be honest, this isn’t really a trend, it is more timeless in the home décor world. Wood planks have been used in decorating for many, many years now. Can you blame designers? Not only do they bring that timeless look, but it also brings a texture that works well with any decorating style. The entryway: It is small, but it makes a big impact when you first come into your home. Also, since it’s a small space it won’t blow your home décor budget. The kitchen: I am not just talking about the wall here, though they do look beautiful. They make a great addition if you have a kitchen nook, if you want a “statement” wall then look no further, and they look great framing a window. Personally, I love them as a kitchen backsplash, which is an inexpensive idea alternative to tile, etc. 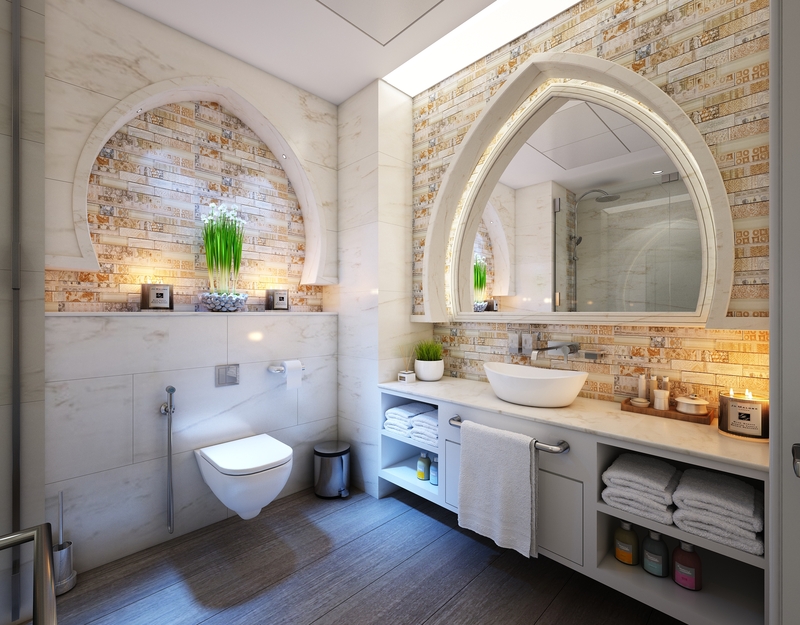 The bathroom: They look great behind a framed mirror and don’t get me started on how amazing your white bathtub will look with wood planks above it. Can you say gorgeous? The bedroom: Wood planks could be used for a headboard! Or a lovely backsplash on your entertainment wall. The living room: You don’t even have to use planks on the whole wall. Doing the lower half of the wall gives your Living Room an upscale look. My favorite and most unique place you could use wood planks would probably be the ceiling! Believe me, when I say how amazing this look is, it will give any room a statement that just says WOW! 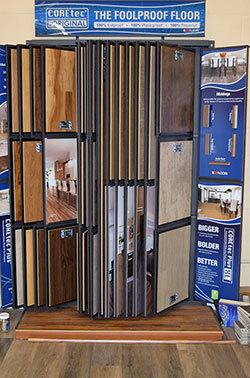 Come into our showroom to look at our selection of wood planks for your home. Trust me when I say you won’t be disappointed. Stay tuned next month for more décor and product information! Did you notice what they did at the Olympics? If you haven’t been living under a rock, you know that the Winter Olympics have commenced. The opening ceremonies were amazing and beautiful as usual. In my home, we always make it a point to watch the amazing athletes represent their country and show what athletic talent they have. One of the exciting sports to watch is skating. Not just figure skating but speedskating! While watching the opening ceremonies, I noticed that they were using the color of the year, Ultra violet in their décor! Well, at least they used it in the lighting. Then I noticed while watching the US women’s figure skaters make history that they used Ultra violet again! We then saw it another time watching the speed skating. Finally, I saw the medals, I thought they looked like flooring. So, I decided to look up what inspiration the designer had when they made them and sure enough the South Korean designer was inspired by the texture of tree trunks. It looks like the designers of the 2018 Olympics took notes from home décor trends and they are putting them to use. I know my eyes will be peeled for more trends. Maybe we can get one of the curlers to come to sweep our showroom! Stay tuned next month for my next article on everything about flooring and home décor! Happy New Year. Just like the calendar, in the design world, it is out with the old and in with the new. Everyone has made their décor predictions for 2018. Move over millennial pink, it’s time to share the spotlight with purple. Ultra Violet is the color of the year, according to Pantone. With such a beautiful color what else can we expect from this year’s trends? Bold patterns, velvet furnishings, warm colors, natural elements, moody palettes, brass accents, tone on tone, gray is back! What is trending when it comes to floors? Dark and cool tones. Yes, the color of the year may be ultra violet, but the darker colors have been on the rise for a while now. Cool colored flooring is easier to maintain than dark floors. However, if you ask me the darker floors look amazing. Another trend in flooring is gray! 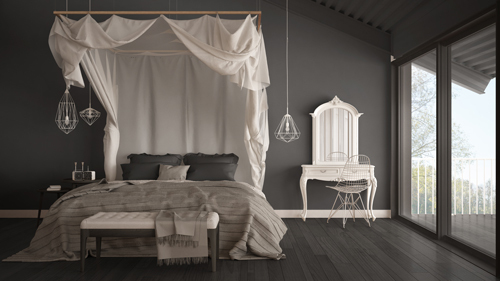 Gray flooring has also been on the rise. You can see it everywhere, wood, tile, tile that looks like wood, planks, and planks that look like wood as well. You can even see flooring on the rise that is a gray-white, gray-beige and whitewash. As people move away from the warm tones like red, red-brown, etc. they move to the darker and cooler colors that are predicted to be the big trend in 2018 but some have also predicted more muted, natural and lighter coloring in decorating styles. I can’t predict what is the best choice for your flooring. If you are in the need of redoing your flooring dark cool colors and gray is a good look for some flooring. Come into our showroom and look at our gray and darker flooring options while we are having our storewide sale! Stay tuned next month for our blog post on a trend that I personally love…Wall Planks! 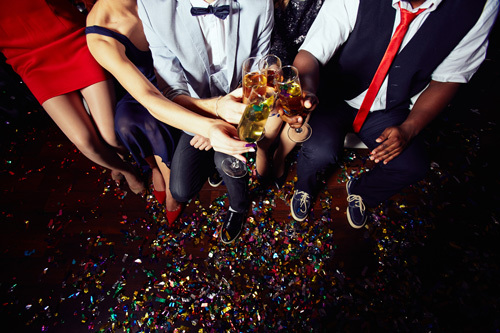 Protect Your Flooring from Your Holiday Party! Can you believe it is almost the New Year?! That means it is prime season for Holiday parties. While you may be looking forward to this, your flooring does not. Previously we talked about how to protect your flooring from your tree. Many holiday parties big or small inevitably create a mess, whether this comes in the form of a spill or dirt tracked in from shoes. It may be slightly awkward to ask your guests to take their shoes off before entering your house but doing this it could reduce the damage and beating that your flooring may take. However, if you are hosting a large party, taking off your shoes isn’t a good idea. If you allow people to enter with shoes, you can place a mat at the front door and be sure that they wipe their feet off before entering but that could be time-consuming and you may miss half of your party. Another option is to lay a tarp on your floors. This isn’t the prettiest and it allows for an easy cleanup. Area rugs are a great way to protect your flooring from a stampede of holiday dancing. They can also serve as decoration to your holiday theme, you can choose festive colors and designs. They should be placed in high traffic areas, such as the entryway, hallway, kitchen and of course your dance floor! The more flooring you can protect, the better. Being unprepared can put a damper on your time with your family, friends, coworkers, etc. You want to be able to enjoy bonding and celebrating with great food and drinks and spend quality time with each other. So, don’t let the hustle and bustle of the holidays deter you from being prepared! We wish you all Happy Holidays! Stay tuned next month to find out some Hot Trends to look for in 2018. 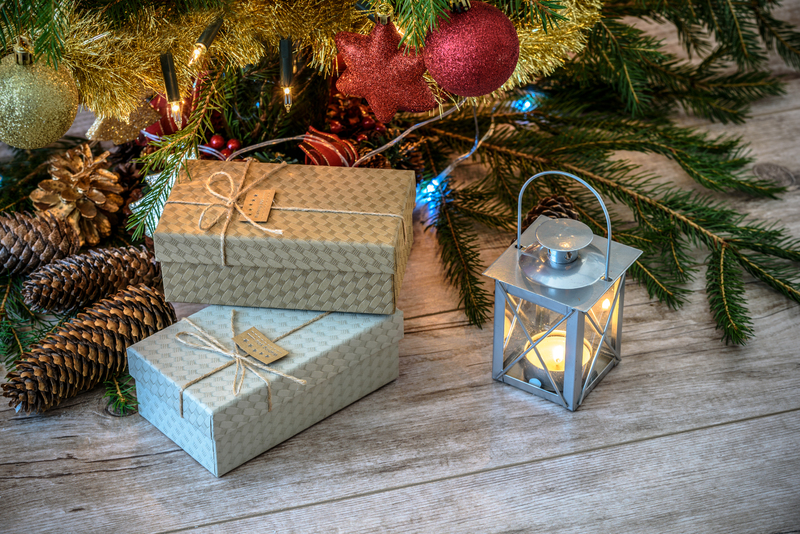 Protect Your Flooring from Your Christmas Tree! Thanksgiving is over. We can finally start the holiday music and bring out our decorations for our Christmas tree. Not so fast! During the holidays, you risk your floor getting damaged not only by your guests, but your flooring is also at risk of being ruined by your tree. We don’t like sounding like a Grinch, but those beautiful Living-room centerpieces have the potential to cause some serious harm. Water, needles and tree sap, oh my!! Failing to protect your flooring can cause damage that will stick around even after the holidays are over. This could be prevented by taking some precautions. Here are some ideas on how to protect your floors from your Christmas tree. Do water your tree, I think that goes without saying. When you don’t, you get all those pesky needles everywhere. However, you also need to be careful not to over water, this has the potential to splash all over the floor. Don’t lay a towel or rug down. It soaks up water and if it spills you could create bowing. Adding rubber stoppers to the bottom of your tree stand will keep your tree stand from scratching your floor. Invest in a better tree stand. Yes, these can be a little pricey but could save you from a bigger expense (A ruined floor). When you take your tree down, make sure you vacuum the needles up. A combination of the broom and the needles from your tree could create a friction and harm the finish on your flooring. There are many ways to protect your floor from your tree. That will give you peace of mind and take some stress away from the holidays! 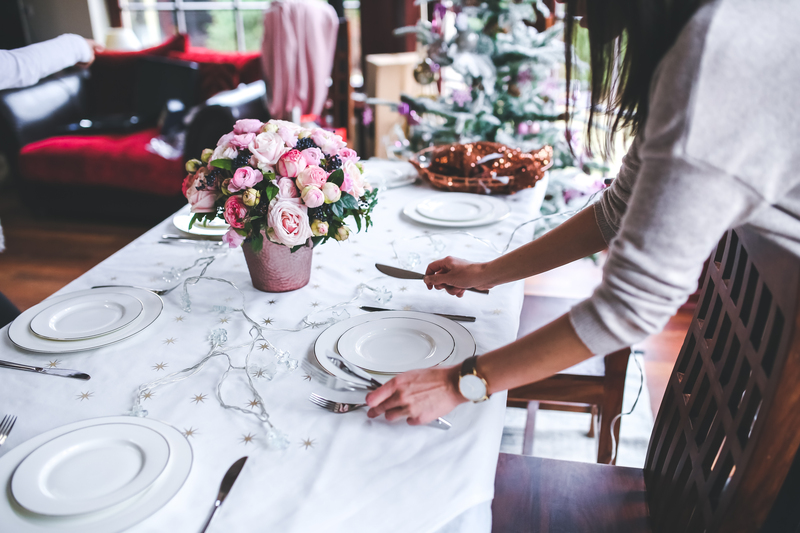 Stay tuned for our next blog on how to protect your flooring during holiday parties. Protect Your Hardwood Flooring During the Holidays! With the holidays fast approaching, your floor is sure to take a beating. With the holiday season comes visitors and that means heavy volumes of traffic. Rubber or foamed-backed rugs cause discoloration on your Hardwood flooring because moisture can get trapped under the rug. Wet mopping can leave excessive amounts of water which could dull your finish and damage your flooring. Oily soaps leave a residue that will be damaging to the floor’s finish. Unnecessary waxing (especially with urethane or polyurethane finish) could not only cause a mess but could damage the adhesion coat. Though celebrating the holidays with all your guests is very fun, get peace of mind by protecting your floors or by having the right flooring. Taking simple precautions now can help you enjoy your flooring for years to come. 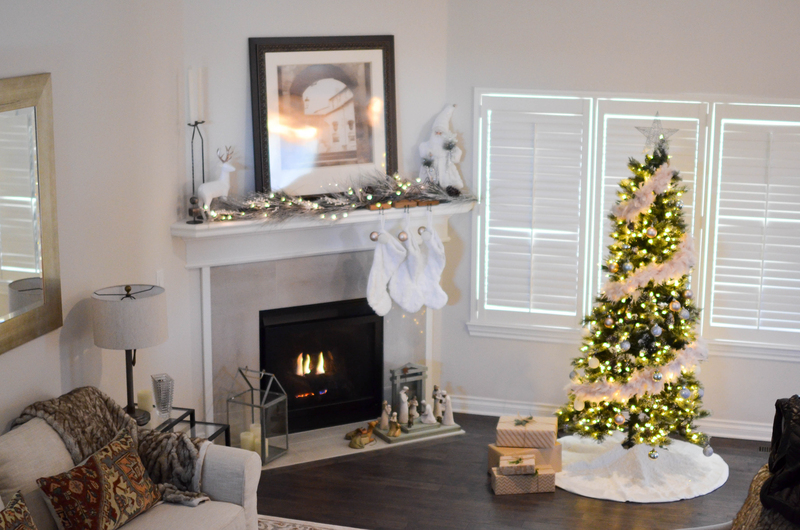 Stay tuned next month for more tips on how to protect your flooring during the Holiday season! Also, stop by our showroom and to check out our Xtreme Holiday sale. The best for your pets! I dare you to go to YouTube and not fall in love with an animal video. Be it a cat, dog, horse, goat or bird our pets have become more than just our little furry friends to keep us company. They are part of our family and in some cases, they are all someone has. 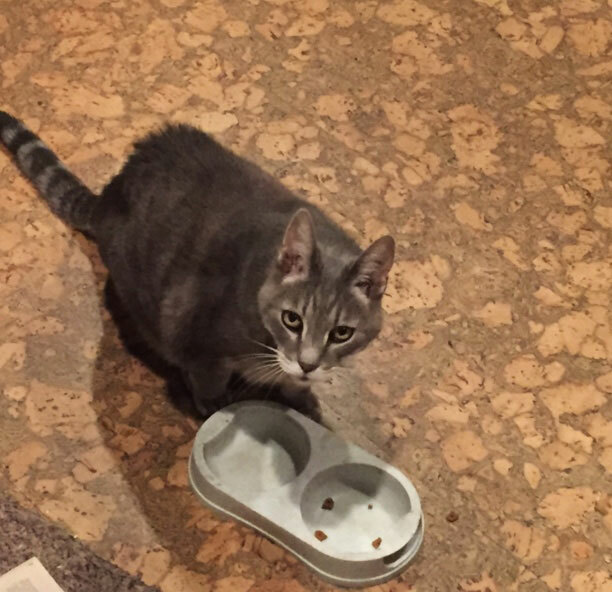 I was scrolling through the internet the other day and saw an article on ‘8 home tech gadgets for your pets!’ The article described several useful items - from smart bowls to smart toys, a smart dog house, and my personal favorite a pet surveillance system. Our animals are so important to us that it becomes easy to spend a lot of money on them. Our hope is that your money is spent on the enjoyment of your pet, not carpet cleaning or stain removal. If stains are a concern, we have a carpet for you. Stainmaster PetProtect carpet does not only resists pet stains but releases pet hair and reduces pet odors. It is also easy to clean, durable and comfortable. Stainmaster PetProtect also is color safe, fade resistant and has a built-in stain protector to resist even the toughest of stains. 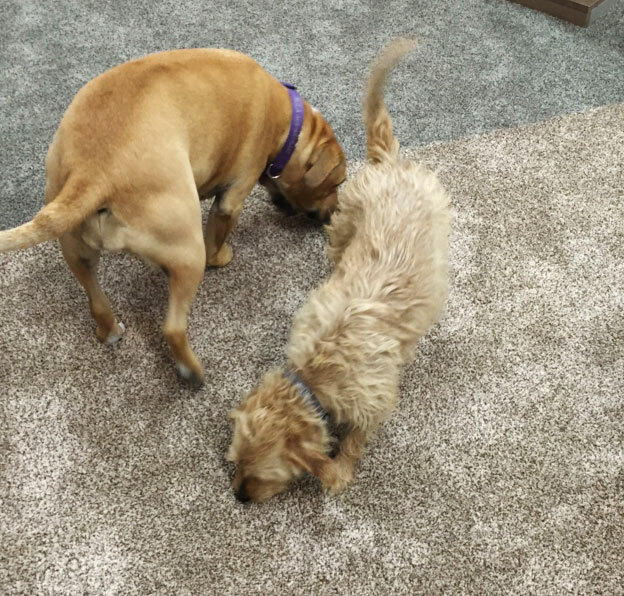 With our StainMaster carpet, you have peace of mind when you are spending time with your pet or family. 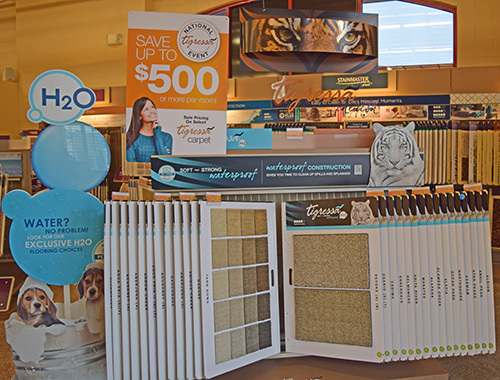 Come into our showroom today to check out our sale on Stainmaster PetProtect! Baroque [buh-rohk; French ba-rawk] adjective: of or relating to a style of architecture and art originating in Italy in the early 17th century and variously prevalent in Europe and the New World for a century and a half, characterized by free and sculptural use of the classical orders and ornament, by forms in elevation and plan suggesting movement, and by dramatic effect in which architecture, painting, sculpture, and the decorative arts often worked to combined effect. Why am I regurgitating this to you? 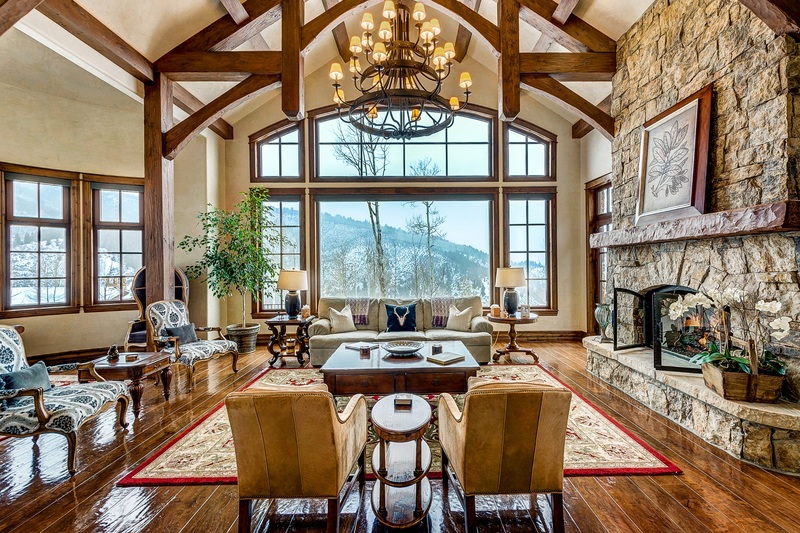 While watching the ever-popular show, Game of Thrones, I thought “Who wouldn’t want to live in these lavish beautiful castles and have a beautiful room like the Lanisters? It would cost me a fortune to create something so epic.” What if there was a way to design or remodel my home that would reflect a level of royalty? 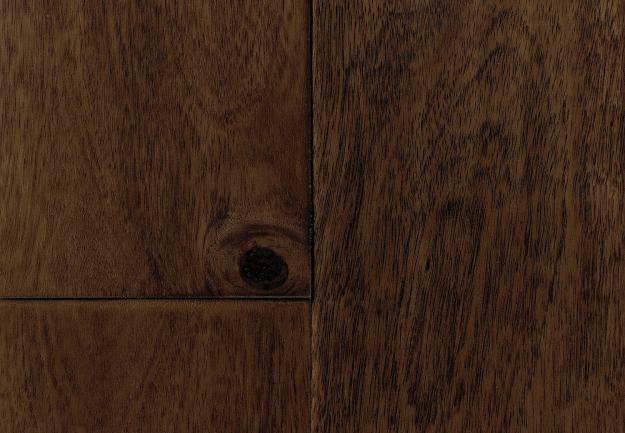 Baroque Hardwood, not only is it beautiful it makes the price of luxury affordable to everyone. Whether it be a lavish bedroom, a medieval dining room, or a bathroom fit for a queen. Look no further, this could be achieved with Baroque Hardwood with a variety of exotic and traditional hardwood species, colors and styles. Not only is this flooring luxurious, it is tough and durable with a protective finish and a surface that makes it resistant to wear and scratches. An additional feature of this amazing flooring is it is also environmentally friendly. When it comes to the housing market, living on the central coast isn’t always easy on the pocketbooks. So, if you are looking to create an extravagant room in your home it can be accomplished with flooring made by Baroque Hardwood. 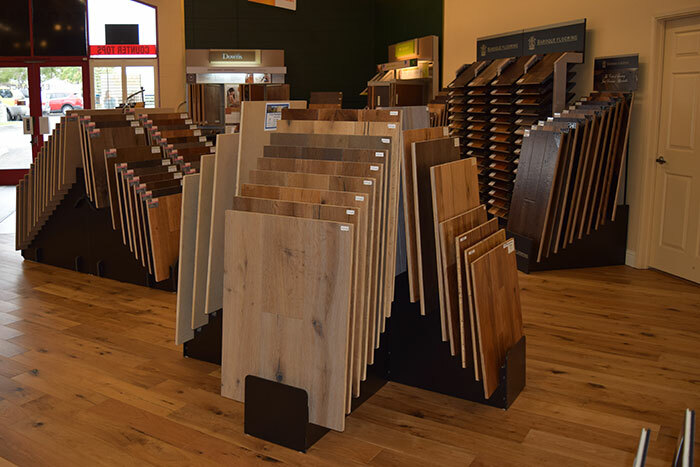 Stop into Phillips Flooring America to see if this flooring is a perfect fit for you. Everyone knows that carpet doesn’t last forever and the last time it was 100% clean was the day it was installed. With regular cleaning and proper maintenance, you can extend the life of your carpeting. Unfortunately, if your carpet sees a lot of traffic it will certainly need replacing sooner than later. Have you ever spilled anything? Are you covering anything up with furniture? Has your kids or pet made a mess and you can’t get your carpet quite as clean as it was before? Chances are you have had one, if not many of these accidents. I know I have. Though many carpets today have a stain protector those wear out over time and become less effective. When fighting stains there are many avenues you can turn too: a store-bought carpet cleaner or a DIY remedy. Unfortunately, stubborn stains such as wine, bleach, ketchup, and mustard just won’t go away. Don’t get me started on mold, mildew and if your furry critter has an accident. Though you may get the surface stain out, bacteria lies beyond within the padding and is nothing you want to mess with and if built up over time, could become a hazard to your wellbeing. I know you can hire a professional carpet cleaner to get out the tough stains! Chances are they are able to go a little bit deeper – but they cannot get too aggressive as they need to avoid weakening the glue that holds together the carpet and padding. Does your carpet have rips, tears or is matted? In high traffic areas, your carpet looks like its worn in. You can probably fix small rips, but larger ones are a sign that your carpet needs replacing. If you own pets you may notice a lingering smell on the carpet. This usually comes from pet dander stuck in the fibers of your carpet. Regardless of how much you clean if the odor lingers this could mean that you need new flooring. Carpet padding is the layer under the carpet that gives you cushioning. It is the padding that takes the most damage from spills. You can tell that it is damaged if it is uneven or wrinkled in some parts. Also if old stains mysteriously reappear after getting your carpets cleaned, the stain is deep in your padding and will need to be replaced. As your carpet gets older it tends to hold in a lot of allergens. If you suffer from allergies more often it is probably time for new carpet. Have you had your carpet cleaned many times? 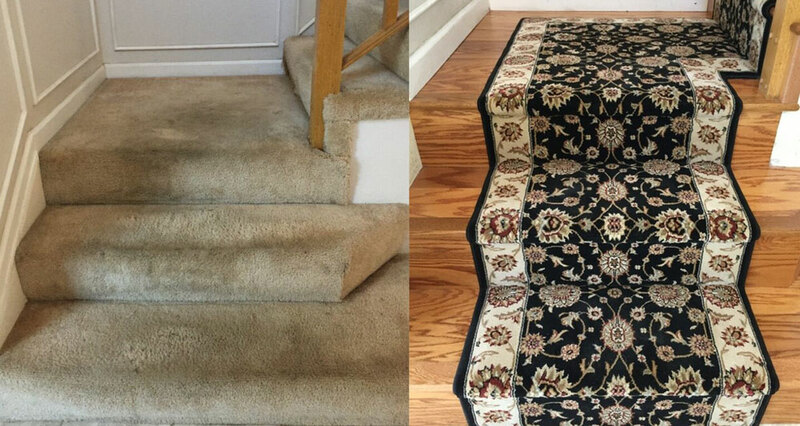 Do you still have the same carpet you purchased your home with? No matter how long and how good you maintain your carpet. Most manufacturers say carpet lasts about 10 years. Here at Philips, we carry a variety of carpeting and currently we have a Home Makeover sale going on. If you see any of the problems listed above with your carpet talk to us and we can help determine the best course of action. Stop by our showroom and we can find you the right carpet for you. What factors should you take into consideration when deciding to remodel your home? If I had it my way, I would remodel every chance I got. Realistically, this is impossible. For anyone who has owned a home, the dilemma has always been should I remodel my home right now or do I need to wait until later? While you may like your home, sometimes it reaches a point where it doesn’t match your style anymore. While spending time thinking if you should or shouldn’t remodel, you should consider a realistic budget for planning and analysis for when the time comes to remodel. Questions to ask include whether to remodel the entire kitchen or maybe just the flooring and cabinets. You may want to ask yourself questions such as whether to remodel the entire living room or whether you are just going to replace the carpet and window coverings. Perhaps you just want to redecorate. While your home could seem drab at times, remodeling a space can allow you to create new and exciting spaces. It allows you to update your home's functions to meet your needs and create the ideal home you are really looking for. However, just like anything else, remodeling your home has its advantages and disadvantages. Cost Savings: While renovating can get pricey it is more cost-effective than moving. You can pick and choose what rooms you want to remodel. The budget you can set room by room and you don’t have to remodel every room in your home. Also, there are ways to save money when you remodel your home. Personal Touches: Remodeling allows you to fine-tune your existing home to your personal expectations. Buying a home may have a few things you want but not all of your must-haves. Major Overhauls: If your home needs a major overhaul, you may not want to take on that task. You could also be interested in downsizing. Financial: Sometimes you just can’t afford the cost of remodeling or it requires loans that you are unable to get. 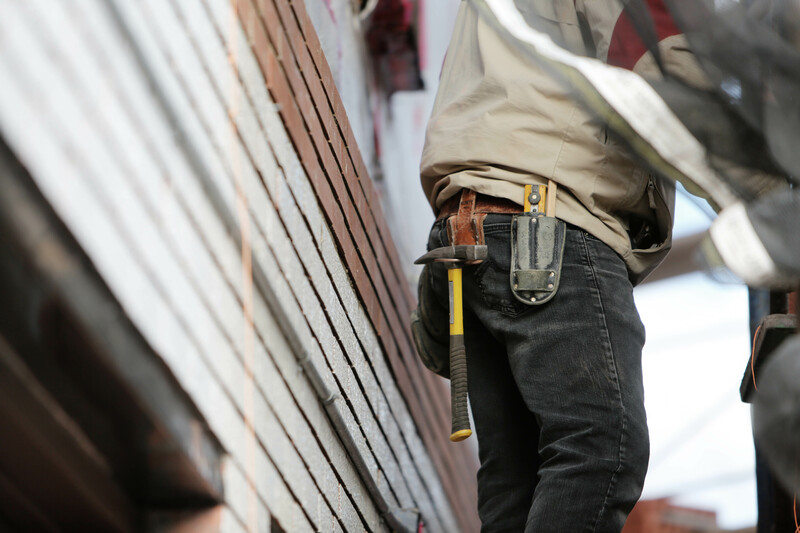 Construction: When you remodel your home, it will be a mess. You may need to stay in a hotel or choose to stay at home with the noise etc. To answer the question of whether you should remodel or not is something that is up to the discretion of the homeowner. Or look for products on sale that can help keep you within budget! At Phillips Flooring America there are always products on sale! Keep your eye out to look for the Home Makeover Sale coming soon. Be sure to come back next month for our next blog article! What are the types of H20 Flooring? I don’t know if you have heard but there is a big sale going on here at Phillips Flooring America! Now brace yourself, you can get 30-50% off any of our H20 floorings. Yes, you read that correctly! Now you may be asking yourself, what brands and types of H20 flooring are on sale? Well, that is why we are here to answer those questions for you. Here at Phillips, we love our H20 flooring! These types of flooring use breakthrough technologies to give them a high-end look, waterproof protection, low maintenance requirements and durability. That makes this type of flooring ideal for homes with children and/or animals. You can have H20 flooring in any room; kitchen, laundry, bath, you name it! Tigressá carpet is perfect for that “life happens” moments. This innovative H20 carpeting repels spills and other liquid mishaps that can ruin your day – and your carpet. This is one of many reasons why Tigressá is a wonderful choice. H20 Downs flooring offers you a beautiful, rich, type of flooring. 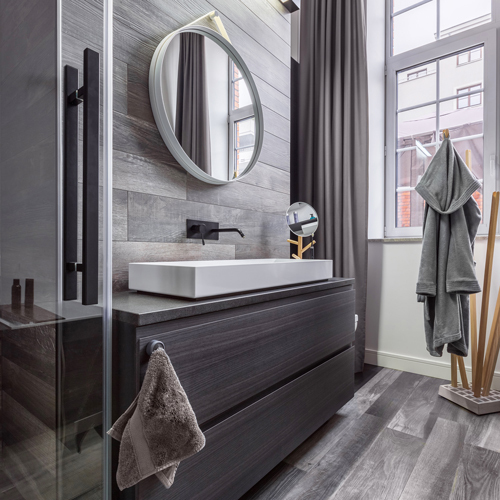 With their vinyl tile, the stone and wood look impeccably real. It is perfect for those rooms where most surfaces won’t stand up, like the kitchen and bath. The tough exterior and unique style make this flooring superb. COREtec flooring is one of the most superior types of flooring in the marketplace today. COREtec is 100% waterproof. With COREtec, you get the elegant and high end looking floor you want without the large price tag. 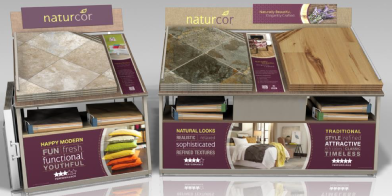 Naturcor is technologically advanced layered construction, which makes it exceptionally resilient and comfortable underfoot. With a variety of style choices such as realistic wood to stone, you can have a look rivaled only by nature itself. To see our line of H20 flooring for yourself and to see how these flooring types can liven up your house, stop by our showroom today! Why is Tigressa the Best Choice? beat yourself up about it. Just scroll down a little more and you will find it! Or just read this article and I will share with you why Tigressa is a great choice for you. In our previous article, we told you about the construction, the feel, and the durability. However, we didn’t go into the best detail about Tigressa carpet which is the fact that it is WATERPROOF! It’s unbelievable how far the technology of carpet has come to reach this spectrum on first-class engineering. The way that Tigressa H20 takes tackling water, spills, and stains to the next level is one of a kind. Tigressa has a waterproof backing that will not allow spills or pets leak through to the cushion and subfloor. The advantages of this are obviously clear. Let’s face it, we have all spilled something on the floor and we always make a run for the cleaning supplies to prevent it from leaving a stain. I don’t know about you but this hinders most people from hosting parties. It is also important when you have pets. While your cute new puppy fluffy is adorable, it is bound to have an accident. But with Tigressa these accidents aren’t time sensitive. The performance of Tigressa is second to none. You may be thinking that the durability of the carpet, the look may be compromised. Not in this case! This is one instance where you can have your cake and eat it too. On that thought, you can even drop your cake on the floor and not worry about the stain from the red frosting. Take the stress of messes out of your mind with Tigressa. We promise that you won’t regret it! Stay tuned next month for more information about our Products here at Phillips Flooring America!! What is Downs H20 Carpeting? When I think of “Downs”, carpet isn’t the first thing I think about. We often think of those soft warm blankets and pillows we get to snuggle with in bed. It’s a luxury many enjoy. Hang on to your hat, there is a big innovation in the carpeting world that will make you rethink what you associate with the word “Downs”. Downs H20 carpeting is the latest breakthrough innovation in flooring. It gives you waterproof protection, outstanding durability, and an affordable high-end stylish designer look. 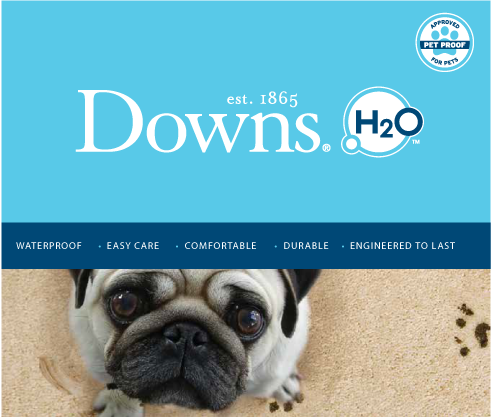 Downs H20 is perfect for pet-friendly homes in any room you choose. With hard surface taking the industry by storm, one of the most innovative soft surface designs in the flooring industry is the H2O Carpet backing. 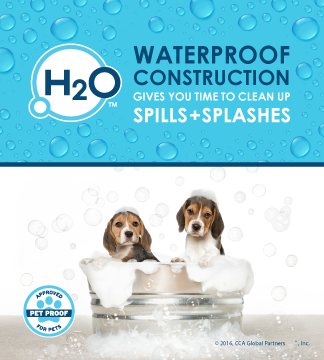 Flooring America/Flooring Canada’s Downs H2O is perfect for the active family with pets due to its unbeatable protection against odor, stains, urine, and hair without giving up softness. The Downs H2O carpet is constructed of a commercial-grade thermoplastic backing, which provides a superior moisture barrier and flexibility. Additionally, the thermoplastic backing is lightweight allowing installers to have an easier time handling the carpet. So come by our showroom today to take a look at the must-have Downs H20 flooring!!! 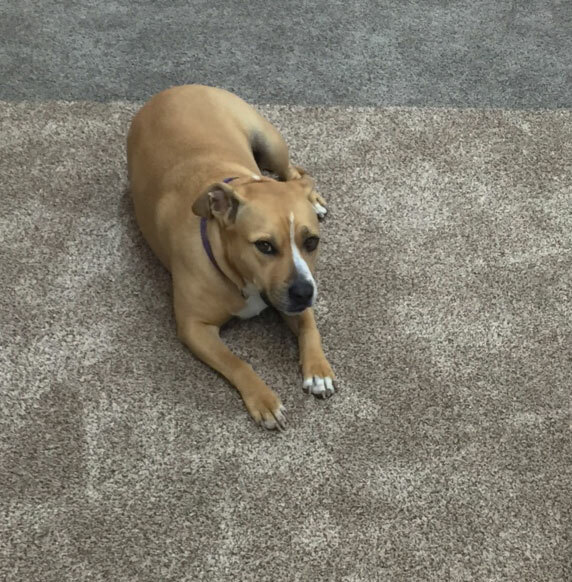 Pet-Friendly Flooring; is My Flooring Pet-Friendly? What types of Pet-Friendly flooring are best for you? I’m glad you asked! Whether you are remodeling or building a new home, choosing the right flooring is essential. For pet owners, however, this decision is crucial. Pets will undoubtedly cause more wear and tear (for example scratches, stains, and dirt) over time. Here are types of flooring that we carry at Phillip’s Flooring America that are the best choice for you as a pet owner. Scratch/Scuff Resistant, you don’t want your pet’s claws scratching up your floors. Comfort, if you are like me, then your pets are like your family and you want them to be comfortable. Your pet’s traction, as funny as it may be to see your animal slide by you, they could potentially get really hurt and it also can scratch up your beautiful flooring. Damage Resistant is probably the most important. If you just got a new pet that isn’t potty trained or likes to chew and scratch things, having a floor damage resistant is something you are in need of. Easy to clean, because of animal hair. It’s literally everywhere! Hardwood Flooring is one the most desired types of flooring today. However, it is not always the best option for pet owners. Hardwood floors are more prone to water damage and stains. The best type of Hardwoods to use would be: Oak, Maple, Hickory, Walnut, Mahogany, and Sycamore. Hardwoods to stay away from would be: Pine, Chestnut, Larch, Hemlock, and Fir. The denser the wood, the likelihood it would be more resistant to damage. Hardwood flooring is on the expensive side and could be expensive to replace. 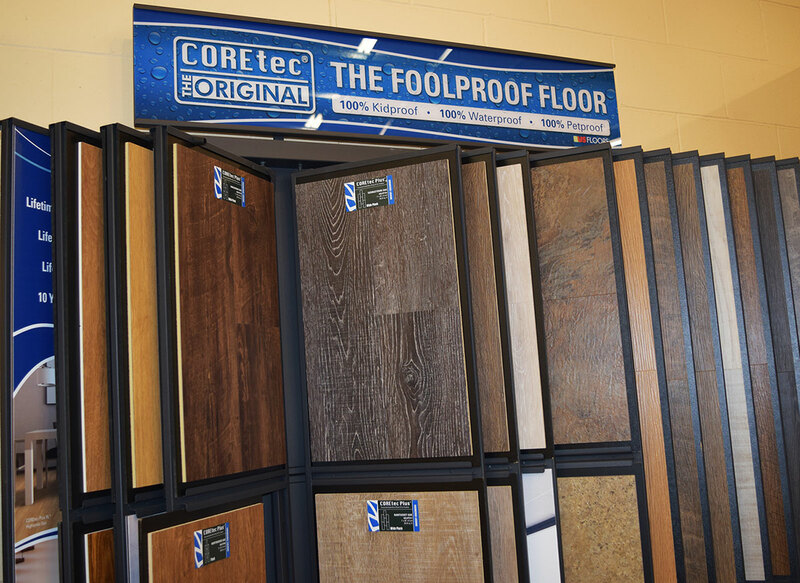 Today, you’re in luck as US Floors COREtec Plus has added a Petproof Warranty. What does this mean? The Petproof warranty is an addition to the Lifetime Waterproof Warranty, Lifetime Residential Wear Warranty, and 10 Year Commercial Wear Warranty. This means your flooring is under warranty for the life of the floor. Downs H20 LVP Flooring has that timeless elegance and long-lasting durability. It has bold colors and consistency with striking, detailed graining. It is superior scratch, scuff and stain resistance that minimizes care and maintenance which makes it ideal for pet owners. Carpet is an obvious choice for your pet’s comfort, giving them a cushiony and cozy place to rest their fuzzy little bodies. However, Carpet is hard to clean and is prone to wear and tear. Fortunately, you are in luck again. STAINMASTER PetProtect carpet has built-in stain resistance that won’t wash off. It is made from SuperiaSD fiber, a solution dyed nylon 6.6 polymer engineered with inherent stain resistance and built-in color that resists fading. This means that when accidents happen, you can use hydrogen peroxide-based cleaners without fear. It is also phenomenal at helping reduce pet odor. Cork is eco-friendly and a crowd favorite. It encompasses a natural antimicrobial material that helps reduce the growth of mold and other allergens, making this flooring a customer favorite as well. It is also durable to withstand heavy foot traffic. Laminate looks similar to hardwood. It is an easy clean up after your pet and is quite durable. Though it is sometimes smooth and slippery for your pets, you can choose a textured or embossed finish to prevent your pet from slipping around. Tile is another great choice for pet owners. It is extremely durable and scratch resistant, as well as easy to clean if your pet makes a mess. The only down side to tile is that it can be a bit cold at times. 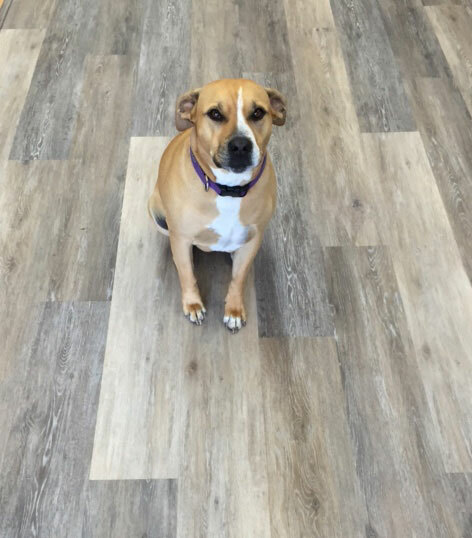 Vinyl flooring is usually the go to flooring choice for pet owners. It is extremely affordable and can be installed anywhere. It is easy to clean and very durable. 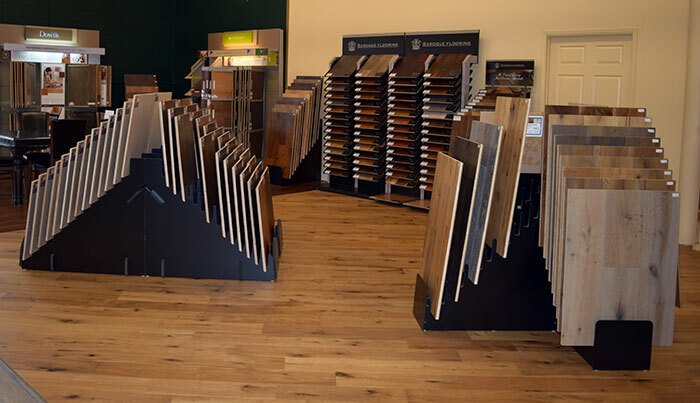 Another amazing thing is that all these flooring types are available here at Phillips Flooring America! Stay tuned next month for our next Blog Article! Recently, we wrote an article introducing you to the world of COREtec flooring which is the next generation of flooring. If you don’t already know, COREtec flooring is amazing! Here at Phillips Flooring America, we like to keep up to date with the latest trends in flooring; we like to think of ourselves as flooring innovators. That’s why we are proud to announce we are now proud carriers of COREtec Plus HD and COREtec Plus Design. COREtec flooring is 100% waterproof and can be installed in wet conditions and not bow or swell. Not only is It beautiful, it is also durable. Isn’t that what you have always wanted in your flooring? 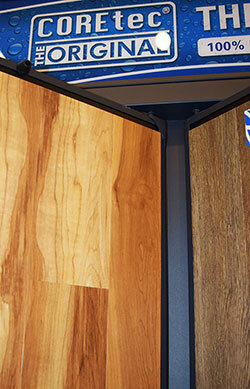 COREtec Plus HD also has a beautiful assortment of colors and grains. This collection employs Embossed in Register (E.I.R.) technology with a 4-sided painted micro bevel edge for a realistic visual unlike any other product out there. The COREtec Plus HD collection is one of the most innovative flooring lines currently on the market. The construction features an extruded core made from recycled wood and bamboo dust, limestone and virgin PVC. Much like COREtec Plus HD, COREtec Plus Design represents the latest in innovation in the flooring industry. COREtec Plus Design employs Embossing technology in Multi-Tone and Multi-Width Planks as well as Multi-Tone and Multi-Width Tiles. The construction is exactly like COREtec Plus Design. Both types of flooring are GREENGUARD GOLD certified for Indoor Air Quality to help keep your home healthy and happy! Be sure to tune in next month for more information on our Products! Searching for Hardwood floors could be a Nightmare on “Elm” St. But not with these Types of Elm! Not many people use Elm and the market for Elm is not in high demand. This is not because Elm Is terrible but because most people have never used Elm and it is not readily available in most cases. If you want a tough durable type of wood then look no further, Elm could be for you. Elm wood is highly valued for its interlocking grains and resistance to splitting when embedded with a nail. Just like Oak and Ash, Elm is a ring porous type of wood. The coarse grain is often wild and irregular making for beautiful and unique lines in your flooring. The color of Elm wood can vary substantially. The sapwood is typically grayish white or white. For example, American Elm trees tend to have a wide sapwood and a light brown to almost grayish-white heartwood. The sapwood tends to darken due to the staining process. One of the nice things about Elm wood is that it is resistant to decay when permanently wet. Elm claims about 20 species in the temperate regions of the world. The most well-known include American lm (Ulmus Americana) known to be domestic trees of the United States. Another brand that is Popular is the English Elm (Ulmus procera), which is most popular in Europe and Great Britain. Siberian elm (Ulmus pumlia) is the most popular in East Asia. American Elm (Ulmus Americana) also known as the Water Elm, Swamp Elm, Florida Elm, Soft Elm, White Elm and Gray Elm is native to Eastern North America. It is one of the most popular in the use for Hardwood Elm. Horticulturists worked on developing varieties to withstand Dutch Elm disease. It is also known as the state tree of North Dakota and Massachusetts. American Elm has a more consistent look with straight-grain, more refined and stains with less contrast. Often the interlocking grain can have a feathery look, it can have an iridescent quality that can be captured with dye stain. English Elm (Ulmus procera) also known as Atinian Elm and Common Elm, native to Europe is one the largest of the Elm species, can be over 130’ tall. English Elm used to be found all over the country in England before the advent of Dutch Elm disease. English Elm flooring is unique and prized. It features a wide variety of color and grain direction. Some characteristics include lots of swirly grain and include burrs making them both unique and beautiful. Siberian Elm (Ulmus pumlia) also known as Asiatic Elm, Chinese Elm and Dwarf Elm was commonly found in Eastern Siberia, Korea, Tibet, India, Mongolia and northern China. This tree is very common to pop up anywhere. The fact that the tree is persistent means it can grow in places most other trees cannot handle. Siberian Elm has a strong grain pattern, especially when stained. Siberian Elm tends to have small knots that can range from a couple per board to heavily burled look. Siberian Elm is a showy wood and not commonly used if you are looking for a subtler look. Whether you look for a statement type of wood flooring or a more traditional type of wood flooring you should consider Elm. It has unique grains and durability which makes for a beautiful and great choice for your kitchen, bath, living room or bedroom floor. 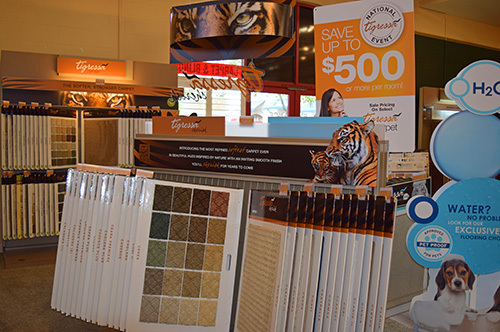 Have you heard about Tigressa Carpet? Here at Phillips Flooring America, we would like to consider ourselves carpet connoisseurs. We only carry the highest quality in carpets and flooring products! 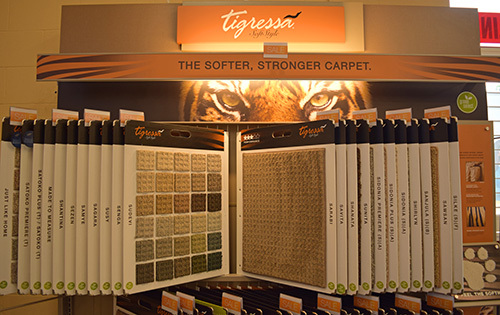 Have you heard of Tigressa Carpet? Don’t worry, we just started carrying it in February. It’s more than just a cool name. We have come across many carpets in our 20 years+ in the industry and Tigressa stands out in many ways. Let us explain why it’s special. Construction: The special triangular fibers that Tigressa carpet is composed of makes it very durable; due to the triangular shape they were able to combine more fibers per square inch, which in turn spreads out the abuse on the carpet. The dense fibers have been proved to show less wear, crushing and matting. Feel: To think all carpet feels the same is a mistake. Tigressa provides a luxurious product that is soft to the touch. Many companies trade durability for soft touch or vice-versa. Tigressa does no such thing. There are various types of carpet available. Our best sellers are H20 Waterproof style Agawam (tone on tone multi-color), Soft and Strong style Satoko (beautiful subtle tweed pattern) and Cherish style Cletus (textured sisal look). Durability: Many tests have been done on the Tigressa carpet, with one of these being from the creators of the patented R2X stain resistant formula. The R2X has repelled the strongest of spills including vegetable oil which is very helpful in many households. There is also available an R2X cleaning product. The results from these tests were that the stains came off easily. One area that people are increasingly aware of today is the environment. The nylon 6 fiber that Tigressa is made from is a naturally sustainable source that can be recycled over and over. They have earned the Green Select label, which is only given to carpets that meet the environmental, safety and health requirements. If you are looking for “green” carpet, look no further, we have what you need. Stay tuned for our next blog article on our wonderful products! What is COREtec Plus Flooring? If you are an average Joe, you may ask yourself what is COREtec flooring? If you have animals, kids, or even high traffic areas in your establishment, this could be the perfect flooring for you! In all aspects of life, the question to ask is what’s next and in luxury vinyl flooring, COREtec is what’s next. It is an alternative to Laminate, as well as LVT flooring. It is a glueless installation and has an underlayment of cork. COREtec Plus features an innovative core structure, a core made from recycled wood and bamboo dust, limestone, and virgin PVC. COREtec is 100% waterproof and it can be installed in wet areas and will not bow or swell when exposed to water. It will not expand or contract under any conditions. The underlayment of cork makes for a warmer and quieter floor that is resistant to mold and mildew. With COREtec, you can get the elegant or high looking flooring you want without the large price tag and with the advantages of laminate flooring. 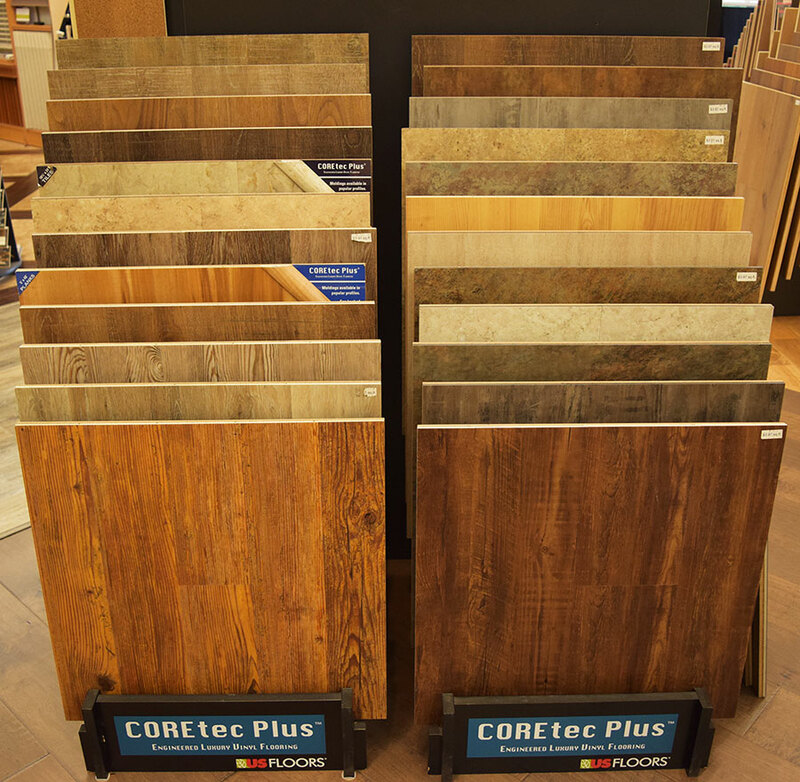 You can also purchase COREtec in a wide variety of styles which include; 5” Plank, 7” Wide Plank, Tile, etc. Soon they will be featuring HD flooring; I know I am blowing your mind right now! What’s HD flooring? This collection features 4 sides painted micro beveled edge for a realistic visual unlike any flooring product you have ever seen. This is as amazing as it sounds. My customer Scott who is a plastics engineer wanted to do some research and testing of products before he purchased flooring for his kitchen and nook. He selected COREtec along with some other brand name products to test due to their stain resistant properties, but was concerned about how they would wear under heavy use. In the abrasion test, he simulated a shoe shuffling over beach sand using and average of weight/pounds of pressure with 100 strokes and real beach sand, then comparing it to the untouched area. In the second test he used an average weight of a dining table divided by four legs and applied 60 pounds on a single table leg for 2 days. He then compared the impression, (indentation) to the original. 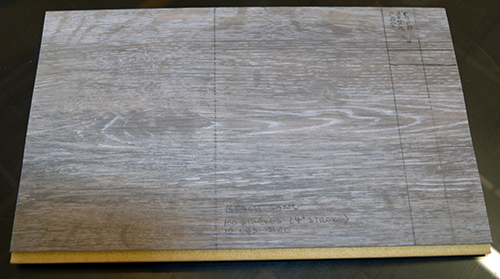 Scott was impressed with the results of both test and chose COREtec for his kitchen and nook floor. Since then the flooring has been installed and he now plans on extending the COREtec out into other areas of his home. If you want to know more about COREtec flooring or have any flooring questions, come into our showroom and we will be happy to answer any and all questions you may have! Stay tuned for our next blog posting next month.